Bill Morgan: Beats the $250k Lottery and Death Itself! Australian man dies, comes back to life, and wins the lottery twice! Australian Bill Morgan is a man who truly defied the odds. He cheated death – surviving a horrible car crash and heart attack, before falling into a coma – and proceeded to win the lottery not once, but two times. He went from nearly losing it all, to gaining more than he could ever imagine. As far as lottery stories go, this is definitely one of our favorites. Let’s start at the beginning, where Bill’s luck seemed like it had completely run out. Back in 1998, Australian truck driver Bill Morgan, was involved in a truck accident that nearly crushed him. He miraculously survived the crash, but suffered a heart attack as a result. He was then rushed to the emergency room, and given a drug that triggered a severe allergic reaction in his body – ultimately causing his heart to stop beating. Bill Morgan had died. But in an amazing twist of fate, that wasn’t the end for him. After being clinically dead for more than 14 minutes, Bill was revived, but remained comatose. He was in a vegetative state for more than a week, and doctors advised his family to take him off life support. It’s a good thing they didn’t, though. Miraculously after 12 days, Bill woke up and eventually made a complete recovery. He was very fortunate to have walked away from the ordeal without any serious health problems. With a new lease on life, Bill was optimistic about the future. He eventually got a new job and mustered up the courage to propose to his girlfriend Lisa Wells. She happily accepted. Some time after his engagement, Bill Morgan decided to try his luck at the lottery. He purchased a scratch-off ticket and instantly won a car – worth about A$17,000 at the time. Bill was expectedly overjoyed. This lucky turn of events soon caught the interest of a Melbourne news station. They decided to cover Bill’s story, and this is where things get really interesting. “I just won two hundred and fifty thousand,” Bill exclaims. “I’m not joking,” he continues. Visibly emotional, he calls Lisa Wells to tell her about the big news. Bill Morgan on Snopes – Is this a hoax? No, this is not a hoax. There is no page for Bill Morgan’s story on Snopes.com, and it would be unnecessary for the most part anyway. Bill Morgan’s story is most likely factual, and has been featured on live Australian television. The story has also been covered by CNN and BBC News. Australian comes back from the dead to win lottery – twice, CNN. The luckiest man alive, BBC News. 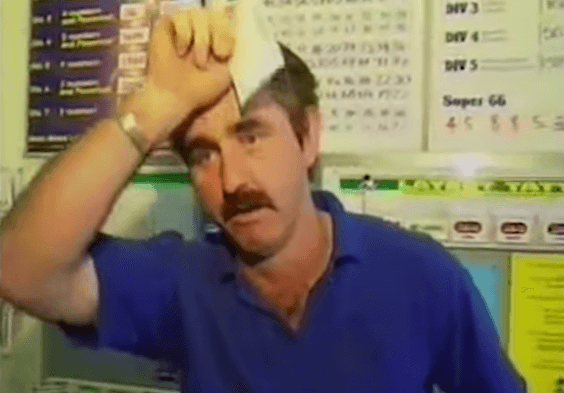 Soon after winning his A$250k prize, Bill Morgan revealed that his lottery-winning strategy was to “keep buying ‘scratchies’ until he won the cash.” Now that he did, Bill apparently has given up his lottery habit. We can only hope that he and his fiance now live a happy and comfortable life together. If you’re curious about other lottery winners’ stories, you can check out our article on the biggest winners and where they are now here.